Getting warmed up for 2018 State at Fairwood G&CC! post-summer events open to the statewide membership as well. Please check the 2019 Schedule regularly for updates. Our state is divided into six districts, and each district holds four one-day qualifying sub-district events, and a two-day District Championship which is the qualifier for the State Championship. All tournaments are conducted under the current version of the Rules of Golf. 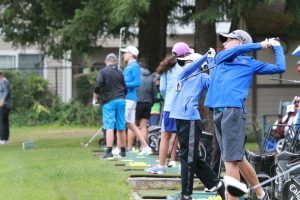 Register for WJGA tournaments here! The complete Schedule for the year. Important information you need to know before you go! Check out these short rules related videos! IMPORTANT Rules for parents and gallery to know! See past year's (2000 - present) tournament results here!